PETALING JAYA: Winning a prestigious accolade like the International Real Estate Federation (Fiabci) Malaysia Property Award (MPA) is a fantastic achievement for any developer, especially when the project that won faced tough odds. When YTL Land & Development Bhd embarked on its high-rise residential project, The Maple at Sentul West in Kuala Lumpur, it chose a site that posed significant challenges, said executive director Datuk Yeoh Seok Kian. “We did not start with the best location in hand. Sentul was regarded by many as a forgotten railway town that was not immediately perceived as a desirable place for home or work. “Based on location and product type, the challenge was made tougher, as Sentul was placed in direct comparison with the more affluent and established KLCC and Mont’ Kiara areas,” he told StarBiz in an e-mail. Rather than go head-to-head with the competition, YTL Land decided to create an entirely different living concept in which a former nine-hole golf course was turned into a private park for the sole use of the community, said Yeoh. “The intent behind creating a new green lung for KL and the city’s first private park homes, was to develop unprecedented living values for city dwellers not found in the growing concrete jungle,” he said. The Maple, comprising two 30-storey towers with 159 units each that come with three bedrooms and a utility room, sits on 2.2ha, of which 60% has been dedicated to landscaping. The winner of the MPA 2008 (Residential High Rise category) and second runner-up at the Fiabci Prix d’Excellence Award 2009, The Maple is the only residence in KL with a private gated park. The units come in three built-up sizes from 1,535 to 1,707 sq ft. It was launched in 2003 at a starting price of RM250 per sq ft. Foreigners make up 30% of its residents. “The Maple is currently valued at an average price of RM500 per sq ft, which translates to 100% appreciation since its launch in 2003,” said Yeoh. On YTL Land having won (multiple) Fiabci awards in the past, Yeoh said: “Naturally, winning Fiabci awards is important for us. It’s the industry’s highest recognition among our peers and the industry’s thought leaders, not only in Malaysia but internationally as well. MALAYSIAN Resources Corp Bhd (MRCB) has new projects worth some RM6 billion to launch at Kuala Lumpur Sentral (KL Sentral), the integrated transport hub in Brickfields, before the end of the development in 2015/ 2016. Group managing director Shahril Ridza Ridzuan said MRCB, one of the country's biggest office space providers, will launch three million sq ft of space next year. These would include room for two luxury serviced apartment towers, an office building, and the 6-star 200-room St Regis Hotel. Shahril said the construction for St Regis will start by mid-2010, followed by the office building. He said the two serviced apartments towers, worth almost RM900 million, will be launched towards the end of next year. "We have land fronting Jalan Tun Sambanthan, which we are reserving for the final phase of the KL Sentral development. We are in the midst of deciding what we want to build on the land. A decision would be made around 2012," Shahril said in an interview with Business Times in Kuala Lumpur recently. Currently, there are RM7 billion worth of on-going projects at KL Sentral, which would be completed between 2011 and 2012. These includes Nu Sentral Mall, a business class hotel, three office towers, an office block for CIMB Investment Group, the KL Sentral park featuring low-rise high-end offices, and 348 Sentral, comprising a 33-storey office tower and 21-storey serviced residence. Shahril said MRCB is in talks with international operators to manage the business class hotel. On the three office towers, Shahril said one building with 27 floors will be taken up by Pelaburan Hartanah Bhd. The two remaining towers will have Korean interest. They will provide capital under the Daol Trust & Fund Co Ltd (Daol Fund), he said. Daol Fund is Korea's first specialised real estate fund investment and management company. "The structure will be similar to a real estate investment trust (REIT) where the Koreans will invests in the towers, and we would manage it for them for a few years." On replicating KL Sentral, Shahril said while it would be difficult to do that in Kuala Lumpur due to scarcity of land, there is no doubt the development would be taken international. He said MRCB is in talks with potential parties to replicate KL Sentral in the Middle East and Asia Pacific, including in China and India. Malaysian Resources Corp Bhd (MRCB) plans to undertake its biggest development project ever in the Klang Valley by as early as next year. The planned project is expected to dwarf MRCB's flagship Kuala Lumpur Sentral (KL Sentral) transport hub in Brickfields. Group managing director Shahril Ridza Ridzuan said MRCB will use part of the RM566 million raised from a rights issue to buy land for the development. "We are planning the next big thing after KL Sentral. It would be something more exciting and bigger than any of our existing projects," Shahril said. KL Sentral is due to complete by 2015/2016. "We are looking at a few plots of land. Depending on the land size and location, we will decide on the best development to do," Shahril said in an interview with Business Times in Kuala Lumpur recently. He said the group is also buying land for new commercial and residential projects in 2010. MRCB, which has RM7 billion worth of construction jobs in hand, has proposed to offer up to 483 million new shares at an issue price of RM1.172 each. The fund-raising exercise is targeted for completion in the first quarter of next year. Nu Mall project at KL Sentral and expand its environmental engineering and infrastructure business. For infrastructure development, Shahril said MRCB will bid for the RM7 billion Klang Valley Light Rail Transit (LRT) extension project. He said tenders for pre-qualification will be out soon. "We will bid for the project either as a whole package, or in smaller packages. It would depend on what the government wants," Shahril said. MRCB is also trying to build up its asset portfolio. 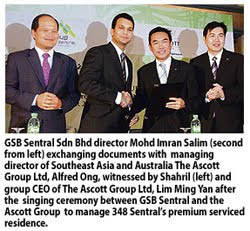 It now manages three office towers at KL Sentral and one in Shah Alam. By 2011, it would manage four new towers at KL Sentral, currently under construction. Shahril ruled out injecting the properties into a real estate investment trust (REIT). "We are already doing a similar structure and concept as a REIT. We are managing properties for investors for a management fee. We like what we are doing and would build on that," he said. UEM Land Holdings Bhd's group net profit was higher at RM7.54 million in the third quarter ended September 30 2009 compared to RM1.11 million a year ago, due to lower cost of sales and higher other income and results from associates. However, revenue in the third quarter slipped 7.1 per cent to RM72.79 million from RM78.37 million due to lower strategic land sales. This was however, mitigated by overall higher property development sales. In the first nine month ended September 2030 2009, UEM made a net profit of RM10.68 million on the back of a RM197.99 million revenue. This compares to a net profit of RM65.55 million and a revenue of RM329.67 million achieved in the first nine months of 2008. As the group performance continues to be affected by the global economic uncertainties, the company does not expect to achieve its KPI targets of 20 per cent in revenue growth and a 6 per cent return on equity in the year ending December 31 2009. MELATI Ehsan Holdings Bhd plans to buy four pieces of land measuring 109,743 sq m in Pekan Padamaran in Klang, Selangor, from TPPT Sdn Bhd for RM15.5 million. The purchase is part of the group’s plan to acquire strategic land bank for residential and commercial property development at the Southern Klang corridor.